Each chapter of Demon Fish covers a different topic from the world of sharks. These include how certain native cultures worship them, global shark fisheries, ecotourism, exciting new scientific discoveries, and conservation policies. To cover such an enormous variety of subjects, Juliet spent years traveling the world and interviewing dozens of experts. 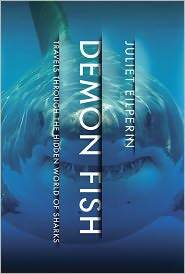 Demon Fish not only includes a ton of information, but explains that information in the way that makes all of Juliet’s articles such great reads. I’ll happily give Demon Fish one of the highest compliments that a shark scientist who has been teased for being hyper-critical of shark media coverage can give: Juliet did her homework and got most of it right. She continues to be one of the “good guys” in the media, and I highly recommend Demon Fish to any shark-o-phile. Plus it’s just an awesome title.